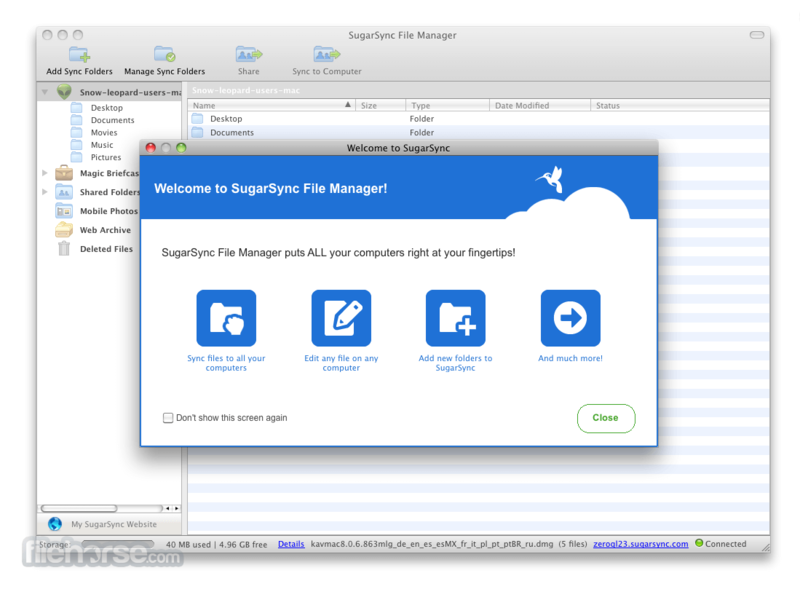 SugarSync for Mac enables mobile consumers and professionals to backup, sync, access and share all their files on-the-go, instantly and securely from any Mac, PC, or mobile device (including iOS, Android, BlackBerry, Symbian and Windows Mobile devices). SugarSync users can sync music, photos, movies and other files in ANY folder and access and share those files via the cloud, providing a Cloud service that matches the way people currently organize their folders and manage their digital lives. SugarSync’s file sharing and collaboration tools also allow users to share any folder or file with a simple URL via social networks, email, instant messaging and more. 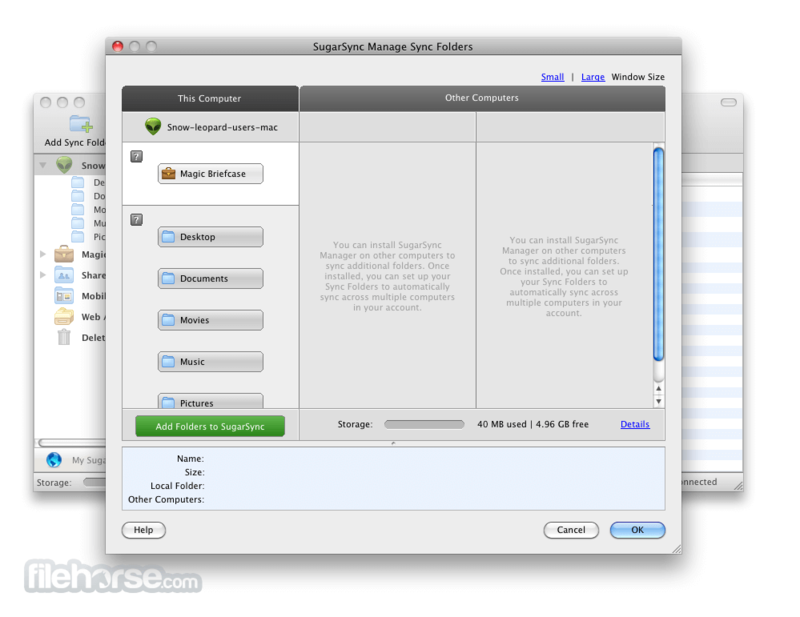 SugarSync for Mac offers 5GB plans for FREE, and paid plans for larger storage needs. All of SugarSync’s mobile apps are free to download, as well. 5GB of online storage and back up, with up to 500GB for paying customers. 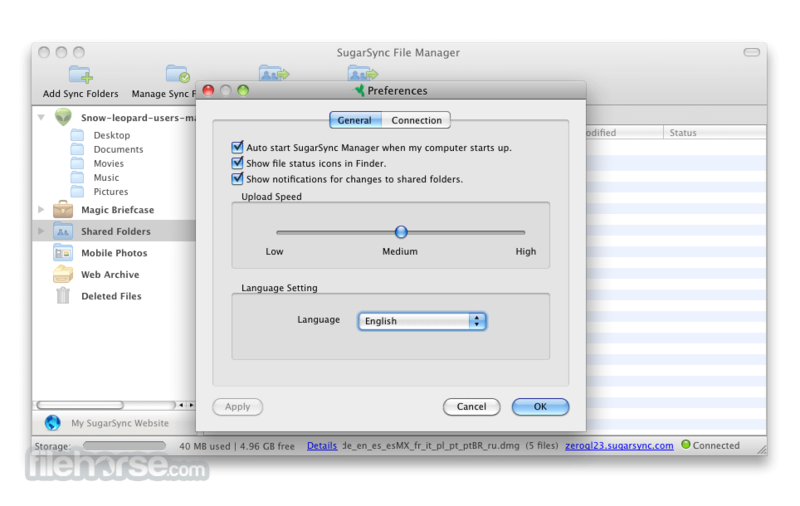 Earn 500MB extra FREE for each referral to SugarSync. Get stuff done on-the-go. Use SugarSync on your iOS or Android phone or tablet to access, share, and manage your files from anywhere. Edit a file and it’s instantly updated so you'll see the latest version when you're back at the office or at home. Note: 30 days trial version. You can store up to 5 GB of data using a free account.